This is a very simple BASIC program I made for my nephew. 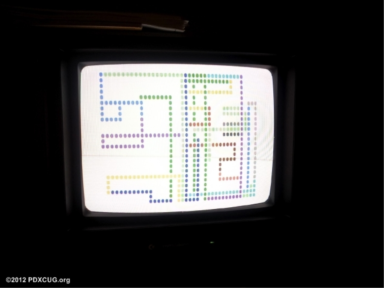 It reads the joystick ports and allows both "players" to draw dots on their own half of the screen. Pressing the button will change colors, cycling to the next in line. My nephew thought it was fun to draw stuff side by side. This snapshot contains a compiled version. LOAD"C/DOTS" for the Blitzed version. I added a delay in the BASIC code: FORXX=1TO50:NEXT which seems to be a decent value after being Blitzed.